Hasami porcelain is from Kyushu island and more specifically the Arita region that has long been a centre for ceramics production. Beautifull proportions and a clean aesthetic combine with functional elements to make for the perfect everday tableware. Hasami porcelain is from Kyushu island and more specifically the Arita region that has long been a centre for ceramics production. Beautiful proportions and a clean aesthetic combine with functional elements to make for the perfect everyday tableware. 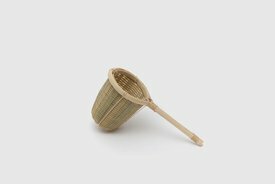 Beautifully knitted bamboo tea strainer. Bamboo being a strong material and resistance to water, this strainer will last for many years. It changes to nice amber colour with use. Everday glass tumbler found in tapas bars across Spain - perfect for water, table wine or beer. Nambu Tekki (cast Iron) bottle opener, finished with a black lacquer coating. Now an iconic design and a perfect balance of form and function these kitchen tongs by Sori Yanagi are a thing of beauty.